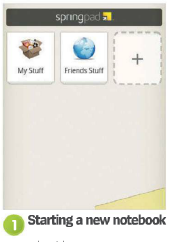 on the main page -the one which contains the notebooks My Stuff and Friends Stuff- tap the box with the ‘+‘ sign in it and you will be able to start producing a new notebook, making organisation easier. 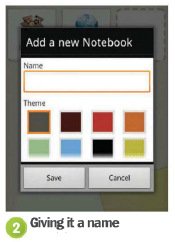 The next stage allows you to give your notebook a name. You can also colour your notebook. When you produce a lot of them, lt will make llfe easier lf you colour code in order to be able to swiftly get to the right one. lf you need to edit your notebook in the future or lf you have made a mistake. then press and hold down on the specific notebook and it will allow you to edit it or, if you wish, delete it completely from the app. when you click on a notebook you will see a menu at the too of the screen. when you tap this, you can organise your data according to anything that is flagged or has an alert. Notes can be tagged and organised this way too.